Oh, Barangaroo. Can we even call you a newcomer on Sydney’s foodie scene? At this point, probs not, but what we can say is this not-so-little precinct is a hub for all things food, wine, cocktails and a damn good time. From Middle Eastern eats to a three-level rooftop bar, fine dining restaurants to casual eateries, this place really has it all. Here are our favourite restaurants, cafés, bars and everything in between in Barangaroo. At Lotus Dining, you can expect live fish tanks with lobsters and crabs, a curated herb garden designed by horticulture specialists, and an eight-seat dumpling kitchen. You’ll find just about every modern Chinese favourite you can think of, as well as some new Shanghainese-inspired dishes on their seafood-heavy menu. They had us at dumplings. Bringing an authentic taste of Turkey to Barangaroo, Anason is the brainchild of Somer Sivrioglu, AKA the man behind one of Sydney's best Turkish restaurants, Efendy. Here, you can expect a range of seaside-influenced mezes like octopus cooked over the coals, served with mastic and couscous, plus hearty dishes of lamb short fillet with eggplant begendy and heirloom tomatoes. Serving over forty varieties of vermouth, Banskii is the place to be if cocktails are your thang. 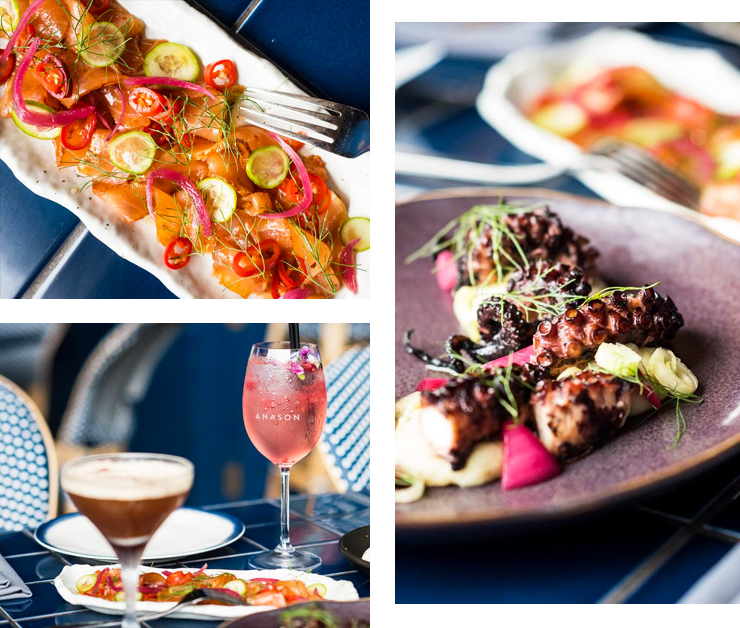 The Mediterranean-inspired menu is designed to be shared, incorporating botanicals to match the iconic outdoor Sydney scene. Vermouth mussels cooked in nettle butter, we’re coming for you. NOLA Smokehouse & Bar delivers on everything its name promises—top-cut meats cooked with southern-style roasting—think dry-aged beef brisket, smoked and pulled pork shoulder and spit-roasted lamb served with simple slaw or BBQ-spiced garlic corn on the side. Oh, and their impressive selection of American whisky doesn’t go astray either. Some of you might be familiar with Dukes, the Melbourne-born coffee legends, and now they’ve set up camp in Barangaroo. The menu at South by Dukes changes constantly, but house-made sambos, fruit salads and other breakfast essentials are available everyday. If you’re a batch brew person you’ll be please to know this place serves up the goods, plus filter and AeroPress coffee are also available. 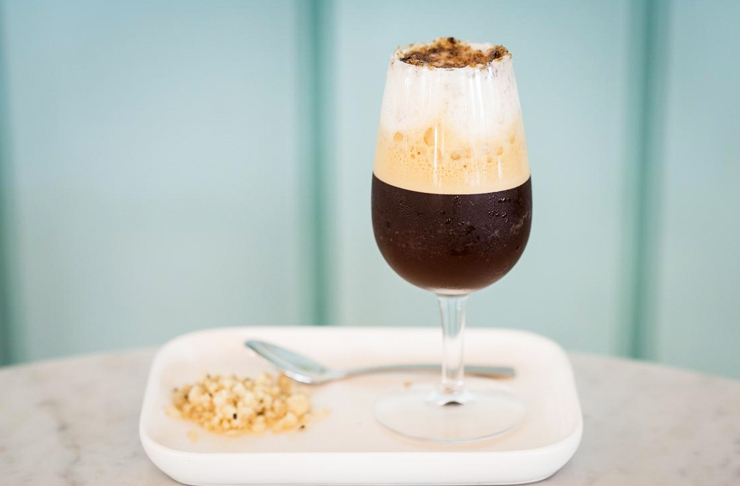 You’ve just stumbled upon the home of Sydney’s salted macadamia espresso martini and that is a very good thing, my friends. As well as a killer cocktail list, the team at love.fish serve up some delicious food. Our favourite starter? The Hiramasa kingfish carpaccio with roasted avocado, pickled turnip and pea shoots, of course. This authentic Thai restaurant at the southern end of Barangaroo is known for its fresh flavours and use of seasonal produce. Grab some quick Thai street food throughout the day or take a seat and enjoy dishes like massaman veal osso buco after the sun has gone down. Part of Matt Morgan’s three-level foodie heaven, Barangaroo House, House Bar is the most casual choice. Grab a bucket of prawns served with bread and cocktail sauce along with a few pitchers of Pimm’s or one of the 50 beers on offer and you’re set for the arvo. The literal heart of Barangaroo House, Bea is a fine dining restaurant with fab cocktails and a cracking wine list. Oh, and the food? It’s damn good. Think contemporary Australian eats made with local ingredients—the marron gratin is only the beginning. This spot is the literal cherry on top of Matt Moran’s Barangaroo House. The rooftop bar is all about smoky beverages and hella smoky feeds to match (yeah, you should be scheduling after-works drinks here immediately). The 400-strong wine list is the only convincing you need. The chicken institution has set up shop in Barangaroo and we’ve never been more thankful for anything in our lives (no exaggeration). Bring the squad along and order a couple of spicy chicken sandwiches with a side of wings with Belles' blue cheese sauce. You can thank us later. Inspired by Barcelona, Born by Tapavino is dishing up tapas you didn’t know you needed in your life until now. Olive oil poached cod, catolina peas and jamon, plus braised beef cheeks with chickpea and mojo verde are just a sneak peak of the all Spanish menu. If you’re a lover of French food, wine and good service, Eté is the next Barangaroo restaurant on your list. This place is all about seasonally shifting produce, beautiful floral arrangements and contemporary artwork was chosen to perfectly match the menu. They will transport you to that French summer holiday you’ve been dreaming of lately. We’ve got our eye on the Parisian-style mid-week lunch ‘plat du jour’ dish which changes weekly and comes with a glass of wine or beer. 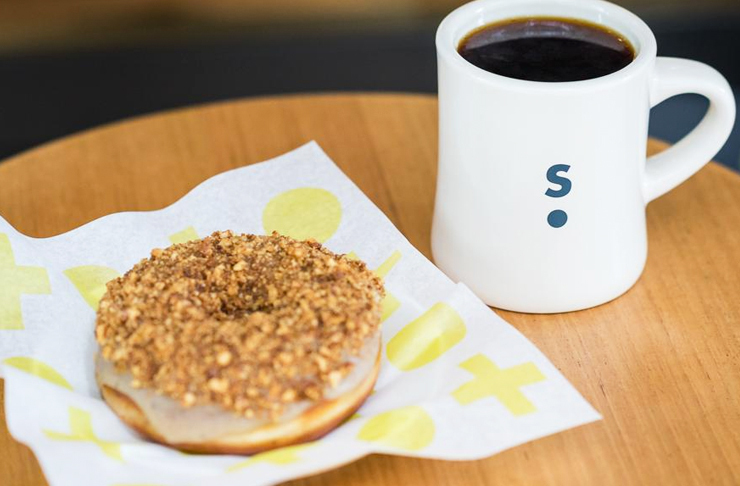 Shortstop may just be the crème de la crème of doughnut shops Sydney and we’re not ashamed to admit this Melbourne native is one of our favourites in town. With traditional yeast-risen doughnuts with less conventional flavours (maple walnut and brown butter, hello?) and the filled variety (like their rhubarb cheesecake doughnut), you don’t have to tell us twice, we’ll be grabbing one of each. Billu’s is seriously dialling up the spice-meter (and we’re pretty rapt about it). If you want a taste of ‘real’ Indian fare, then Billu’s will become your go to. We’d even settle for a plate of their mouth-watering, buttery naan to be fair. For a meat party like no other, The Meat & Wine Co.’s steak menu includes a 1.5kg Wagyu T-bone to share (or maybe not to share? ), and a 300g hanger steak dry-rubbed with native peppers. We’ll also be putting in an order for a full rack of pork ribs, slathered in their signature basting sauce because our motto (as always) is 'go hard or go home'. Untied Rooftop doesn’t take itself too seriously, oozing laid-back tropical North Queensland vibes and a bright décor to match. The fruity cocktail menu has been designed with the tropical theme in mind and our top picks are the sweet Captain Harlock’s Lost Treasure and the Peg Leg, which is a twist on the classic Pina Colada. Sold? We thought so. 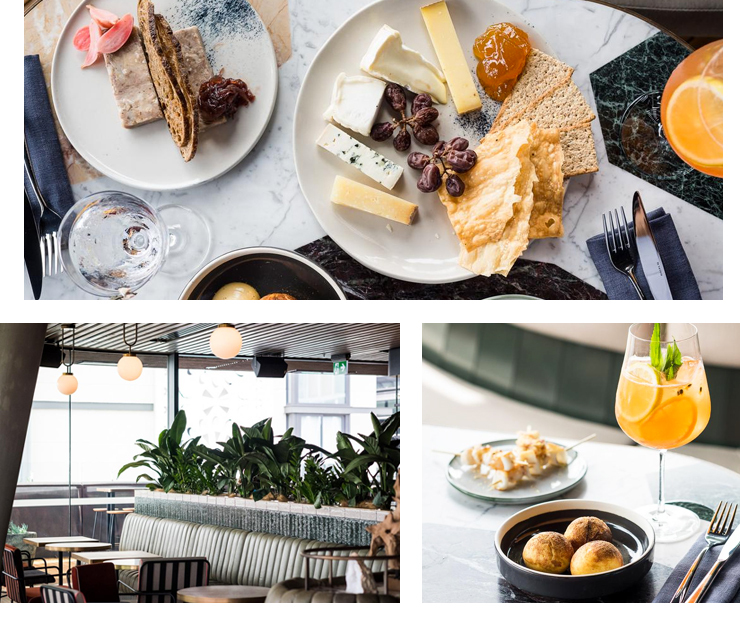 One of the Northside’s favourite cafes is now bringing the brunch goods in Barangaroo and yes, this is where you’ll be heading for your morning coffee and business meetings from now on. Their classic brekky staples will brighten up your Insta feed and as soon as the sun sets, the cocktails will do just the same. Heading around the corner to Darling Harbour? Read this.